Just like adults, babies are social creatures and seek out others for love and comfort. They communicate from the start that they seek nurturing. For a long time, the parents’ emotional connection to the newborn was referred to as a bond that happened instantly. This put a lot of pressure on new parents who needed a bit more time to adjust to their new caregiving role. We now know that the burgeoning parent-infant relationship is actually more like a marathon than a sprint. The relationship process, or attachment, does not happen overnight. Rather, attachment is created over the course of thousands of brief but meaningful parent-child interactions that occur as part of daily caregiving in the first year or two. Every diaper change, every bottle or breast feeding, every gentle touch; all contribute to attachment. As such, attachment takes many months to fully develop. Nearly 50 years of research on the subject have taught us a lot about how attachment forms, as well as its lifelong benefits. Babies come into the world prewired to understand that their survival depends on others. 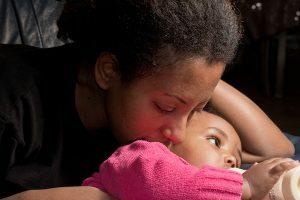 But attachment is about more than survival; it’s an emotional connection that meets the needs of both parent and child. It’s often described it as a dance, because when babies have a strong, secure attachment with their caregivers, there is a smooth, give and take quality that feels effortless between them. That is not to say that babies who are securely attached never cry or fuss, because they do. But securely attached babies are distinguished by the way they are more easily comforted in the presence of their nurturing caregiver. They actively seek out their caregivers when they are distressed, without being overly clingy or dependent on their parent. As they grow, they are able to explore their environment with confidence, and return as needed for emotional connection. How can parents support secure attachment? Parents who react sensitively and consistently to their infants put them on the pathway to secure attachment. The idea is that babies who regularly receive such care start to see the world as a dependable and nurturing place. They can then focus their attention on learning about the world and their place in it, instead of being concerned with whether they will be nurtured. How do we know what babies experience when they feel this way? For decades, the strategy researchers used to study secure attachment was videotaping parents and their infants together under mildly stressful situations, and then observing the tiny moments of connection that occurred, or didn’t occur. More recent research uses cortisol (a stress hormone) to measure a child’s level of response. Interestingly, it is under moments of stress, such as separating from their caregiver and then reuniting, that securely attached babies show the clearest signs of healthy relationships. Usually, this is shown through crying at some point during the separation, then recovering well soon after the parent returns to comfort them, and finally moving on to happily play. Does this mean I need to respond to every whimper or risk attachment problems? No, not at all. Attachment doesn’t require you to be at your baby’s side every second. Some have misinterpreted attachment research to think that this is the case. In fact, the parent-child relationship is meant to be a balance between dependence and independence. In the early months, babies cry for a lot of reasons: discomfort, overtiredness, and hunger are a few. Parents need to be reasonably available to their baby’s needs, but that doesn’t mean that a baby shouldn’t be given the opportunity to learn to self-comfort at times. In fact, that is an important skill for infants to learn over time. Parents across cultures differ in terms of how comfortable they are with letting their babies cry. They get a lot of advice about how to behave from family members and strangers alike about crying, spoiling, sleep routines, and more. Know that the evidence shows that a wide variety of parenting approaches can result in secure attachment. So as long as you are fairly consistent and nurturing with your baby, you will develop a healthy relationship pattern that works for the both of you. Can babies have more than one attachment? The answer to this, experts agree, is yes. This research should be reassuring to working parents who worry that prolonged absences from their infant is a risk to a secure attachment between them. Babies can hold simultaneous secure attachments with adults who regularly nurture them. The key is to be fully present when with babies, so that you can truly read their cues. It takes practice to distinguish between a hungry cry and an overtired one. It takes patience to snuggle an upset infant and figure out what works best; whether rocking, swaddling or humming (or a combination of all three.) If your baby interacts with multiple caregivers on a regular basis, it is key to communicate what each of you has learned about your baby’s temperament and which strategies work best to reassure her. It is equally important to agree on which tactics and routines to implement. This will teach the infant that the world is a predictable, comforting place and that she can rely on all of you to meet her needs when she is distressed. What are the benefits of healthy attachment? Studies show that an early, healthy attachment is one of the strongest predictors of a child’s well being. Among the positive outcomes are children who grow up to be self-reliant, manage stress well, do better in school and form healthier relationships themselves. So certainly, healthy attachment is the goal all parents want for their children. And the best way to achieve it is to recognize that no single interaction is going to make or break the attachment, but rather to commit to be being as responsive, nurturing and consistent you can be with your infant. The dance you and your baby do together will not always be perfect, but your relationship will certainly benefit from your constant, loving efforts.